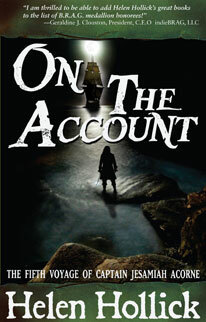 Helen Hollick - Reviews -"On The Account"
The fifth voyage of Captain Jesamiah Acorne. Captain Jesamiah Acorne is in trouble. Again. Arrested for treason and smuggling, believing his beloved ship Sea Witch lies wrecked on England's North Devon Coast, his only hope of escaping the noose is for someone to quash the charges. That someone turns out to be his ex-lover - but there's a price to pay. He needs to find a boy who has disappeared, and a valuable casket that more than one person wants to get their hands on. When people start getting murdered and Barbary pirates kidnap his wife Tiola, his priorities rapidly change - but who is lying about what? Is returning to piracy a wise idea? Is Tiola having an affair with her mysterious Night-Walker 'friend'? Meanwhile, Tiola has her own battles to fight - keeping herself and Jesamiah alive! For almost a minute they stared at each other, Jesamiah with knees bent, one leg slightly more forward than the other, body poised to spring forward and fight, his chin tucked into his chest, eyes narrowed. Maha'dun, too stunned to reciprocate with a similar stance, recovered first. He smiled, spread his hands, palms outward to show he was no threat. "You are Captain Acorne? Captain Jesamiah Acorne?" His heart was hammering, the blood hurtling through his veins. Surely this man was not Tiola's husband? He could not be? Could not be! Remaining suspicious, Jesamiah narrowed his eyes further, tilted his head slightly upward and to one side. "Uh huh." "I have been sent by your wife to find you." Jesamiah sheathed the cutlass, kept the pistol aimed. Said, "And you are?" Thought, This cannot be the 'old friend' Tiola was sending? He ain't old at all! Added, "I've seen you before? Where?" Maha'dun placed his hands together, bowed, his mind racing, his stomach feeling as if it were going to leap up out of his throat. This was Jesamiah Acorne? The man Cara'mina thought she had killed? The man who had, not so long ago, been in possession of a casket and should therefore die? The man who had released him from that foul gaol. The man he had been seeking these past weeks to offer his gratitude to? The man Tiola wished him to protect? The same man. All those were the same man? "On the Account. Fast-paced and utterly compelling."